1. the short part of the brainstem just above the pons; it contains the nerve pathways between the cerebral hemispheres and the medulla oblongata, as well as nuclei (relay stations or centers) of the third and fourth cranial nerves. The center for visual reflexes, such as moving the head and eyes, is located here. The mesencephalon (midbrain). From Applegate, 2000. 2. the middle of the three primary brain vesicles of the embryo; called also midbrain. adj., adj mesencephal´ic. That part of the brainstem developing from the middle of the three primary cerebral vesicles of the embryo (the caudal of these being the rhombencephalon or hindbrain, the rostral the prosencephalon or forebrain). In the adult, the mesencephalon is characterized by the unique conformation of its roof plate, the lamina tecti (tectal plate [TA] or quadrigeminal plate [TAalt]). composed of the bilaterally paired superior and inferior colliculus, and by the massive paired prominence of the crus cerebri at its anterolateral (ventrolateral) surface. On transverse section, its patent central canal, the cerebral aqueduct, is surrounded by a prominent ring of gray matter poor in myelinated fibers; the periaqueductal gray is adjoined by the myelin-rich mesencephalic tegmentum, and covered posteriorly (dorsally) by the mesencephalic tectal plate. Prominent cell groups of the mesencephalon include the motor nuclei of the trochlear and oculomotor nerves, the red nucleus, and the substantia nigra. The part of the brain stem located below the cerebral cortex (joining the diencephalon (thalamus and hypothalamus)) and above the hindbrain (arising from the pons/metencephalon). Tectum/corpora quadrigemina, tegmentum, cerebral aqueduct, cerebral peduncles, substantia nigra, various nuclei and fasciculi. Associated with motor pathways via the basal ganglia; motivation and habituation via dopaminergic pathways via substantia nigra; helps relay information for vision and hearing. That part of the brainstem developing from the middle of the three primary cerebral vesicles of the embryo. In an adult, the mesencephalon is characterized by the unique conformation of its roof plate, the lamina of the mesencephalic tectum, composed of the bilaterally paired superior and inferior colliculi, and by the massive paired prominence of the crus cerebri at its ventral surface. 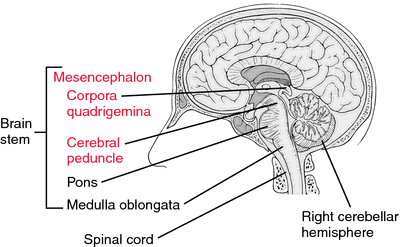 Prominent cell groups of the mesencephalon include the motor nuclei of the trochlear and oculomotor nerves, the red nucleus, and the substantia nigra. that part of the brain lying between the forebrain and hindbrain. It contains the optic lobe and is particularly concerned with hearing and sight. see FOREBRAIN, HINDBRAIN. That part of the brainstem developing from the middle of the three primary cerebral vesicles of the embryo. In an adult, the mesencephalon is characterized by the unique conformation of its roof plate, the lamina of the mesencephalic tectum, composed of the bilaterally paired superior and inferior colliculi, and by the massive paired prominence of the crus cerebri at its ventral surface. n the portion of the brain located superior to the pons and medulla and containing the motor nuclei of the ocular motor and trochlear nerves. It also contains the major pathways and decussations of fibers from the cerebrum and cerebellum. the short part of the brainstem just rostral to the pons. It contains the nerve pathways between the cerebral hemispheres and the medulla oblongata, and also contains nuclei of the third and fourth cranial nerves. The centers for visual and auditory reflexes, such as moving the head and eyes, are located in the midbrain. Called also mesencephalon. causes spastic paresis or paralysis, tremor, nystagmus, opisthotonos and depression or coma. mental depression, ipsilateral oculomotor nerve deficits, and spastic weakness or paralysis of all four limbs or those on the contralateral side of the body. May be caused by cranial trauma, thiamin deficiency, brain tumors, and degenerative or inflammatory disorders of the mesencephalon. Rare presentation of midbrain infarction: Isolated medial rectus palsy. The midbrain organoids display great potential in replacing animals' brains which are currently used in research; we can now use these midbrains in culture instead to advance our understanding and future studies for the disease, and perhaps even other related diseases. All the 7 cases of Wilson's show signal changes as hyperintensities in basal ganglia; 6 cases show signal changes in pons, 5 cases in thalamus, 4 cases show signal changes in midbrain. In males, midbrain IL-1 P [CAPs by time point: F(1,28) = 4. Brain capillary telangiectasias are typically benign small vascular malformations found in the pons and midbrain. What's more, midbrain tissue showed signs of damage and weaker connections with another brain region, the prefrontal cortex. Four days after the initial examination, repeat MRI showed substantial progression of signal abnormality in cerebral hemispheres, thalamus, and midbrain. We report a case of NCC of the midbrain in which chorea was a presenting feature. Rather than beginning in the substantia nigra and moving into the cerebellar regions, nerve damage may begin in the dorsal motor nucleus of the vagal nerve and progress upward into the midbrain, killing neurons all along its path. Midbrain dopamine receptor availability is inversely associated with novelty-seeking traits in humans. The midbrain is like a security kiosk at the gateway to our cognition, and our job as winemakers is largely to get the thalamus to stamp our passport and send us up to the frontal lobes instead of down to the fight-or-flight centers of the reptilian limbic system.